Innovating, Keeping Market Share and ultimately achieving sustainable Profit Growth is becoming increasingly elusive for large companies, as technology and market knowledge grows at exponential rates eroding barriers to entry and ‘rights to play’. Truly innovative corporations are now riding the 6th Wave of Corporate Venturing and are fishing upstream - co-creating the next markets rather than waiting for them to exist. The Corporate Venturing Leadership Forum brings together key corporates who are working with SMEs and other stakeholders in their core or adjacent markets. Join them to learn what works, overcome common barriers and then implement the success within the corporate environment. Accelerators; Incubators, using Ecosystem approaches, ‘Moonshots’, hackathons, joint ventures; using different funding mechanisms are just an example of the techniques that our members have used to varying levels of success. Our Chatham house approach allowing participants the security to identify and explore common themes and obstacles; where appropriate identify and disseminate best practice; and potentially jointly create new ecosytems. The consortium consists of companies in data & comms; Food/ Health tech; Utilitie, IT infrastructure as well as FMCG. Our members already boast of world leaders for incubator/ accelorator programs and creating ecosystems as well as those who recently pivoted away from traditional CV. Whilst these organisations are from different sectors they all have common desires and a series of common issues they can see value in solving is emerging. The concortium meets next on July 12 and membership has been capped at 10 member corporations. ● Measuring success, what KPIs can be used and their various merits. In particular we will be looking at what the true success rate looks like (rather than just the one-off apparently overnight headline successes are); what KPIs can be used at various stages of the process to understand how value is created both for the corporate and for the wider ecosystem. It is envisaged that this topic will include a workshop session with concrete outputs that can be taken away and applied. ● Communicating with conviction to the wider business. This is an area that has beset many waves of CV in the past. Communicating a strong vision of CV impact for the wider corporate, aligned with the long term corporate vision is an issue not just faced by venturing units but also all R&D/ Innovation units. ● Building and creating value from eco-systems. 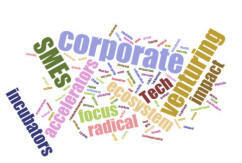 One of the key emerging trends in this area is the concept of eco-systems where one or more large corporates take anchor positions in a wider ecosystem of SMEs. Indeed this might be an area that a JV is created between members. ○ How diversified should your portfolio be, should you include: pre-starts, incubators, accelerators? ○ Do Moonshots play a part and what is their time horizon? ○ How to use the corporate sales channel effectively?